This meal was wholly inspired by my instagram feed yesterday. A woman I follow, posted a picture of chopped cabbage and was wondering what to do with all of it. Someone suggested egg rolls (sounds amazing) and I suggested a slaw, then she suggested an Asian slaw. It was too funny how we went back and forth. Jeremy and I were in our own decisive ‘moment’ knowing that we were hungry but had no idea what we wanted, which can sometimes lead to poor choices. Making an Asian slaw sounded delicious and I knew we had plenty of veggies from our trip to the farmer’s market last week. I incorporated what we had on hand and turned out with this EPIC salad. That’s what happens when you keep wanting to add ingredients. The salad makes plenty, probably enough for 8-10 servings. We kind of buffeted it for a few hours and put away about 5 cups for the next day. Combine ingredients in extra large bowl, evenly drizzle dressing ingredients over salad and toss well to mix everything up. This will give you a good arm work out. If you have a lid for your container, feel free to shake what your momma gave you. Allow the salad to 'mingle' in its juices for at least a 1/2 hour, the cabbage will really soften and release water as well as absorb the flavors of the dressing. 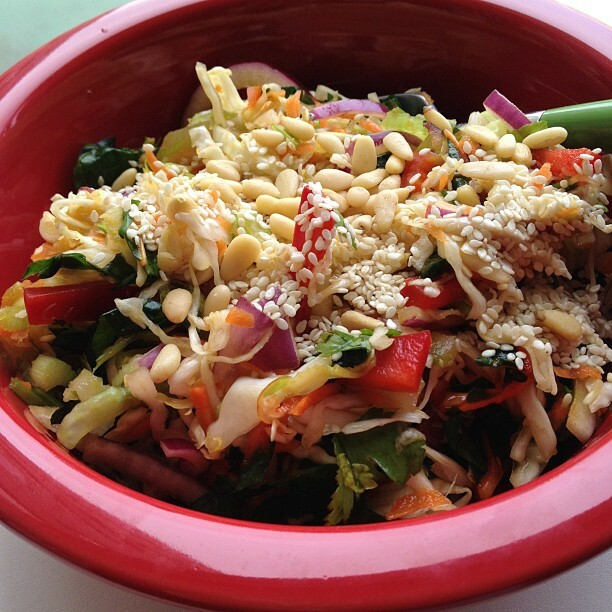 Feel free to garnish with sesame seeds, pine nuts, almonds, or even sunflower seeds. Enjoy! To cut down on your prep time, consider using the shredding and slicing discs from your food processor. I used the shredding disk for the carrots and the slicing for the celery, onion, and red pepper. You could use it on the cabbage too but I prefer the thinness I achieve from using my mandolin. 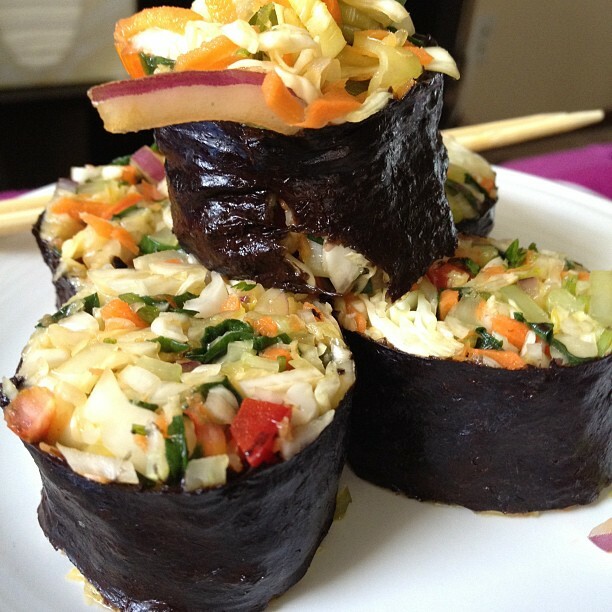 Another friend on instagram suggested making nori rolls out of our epic salad. So, for my 2nd helping I grabbed a sheet of nori out of the cabinet, put a dab of miso along the one edge and rolled it up. So good. It made me very happy I had nori ready to go in the cabinet. This salad would also be good just wrapped up in a collard leaf, Boston lettuce leaf, romaine leaf, or even a Swiss chard leaf – you get the idea! I wish I had made a comment earlier — I just realized there aren’t any for this recipe. This slaw is delicious. I’ve made it multiple times and everyone who’s tried it absolutely loves it. Thank you so much for sharing!